Soul Connection Double Dream Catchers. It is by sharing ourselves with another that we come to truly learn about who we are. Soul Connection Dream Catchers honor this relationship between two people. 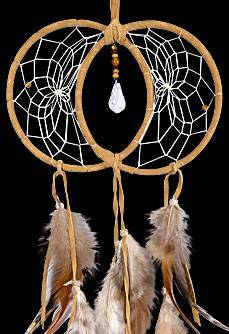 This beautiful dreamcatcher is detailed with feathers and a Swarovski crystal. The hoops are 4" in diameter and uniquely woven for this wonderful design. The overall width is 5 1/2" and the hanging length from top of the hoops to the bottom of the feathers is approximately 17"